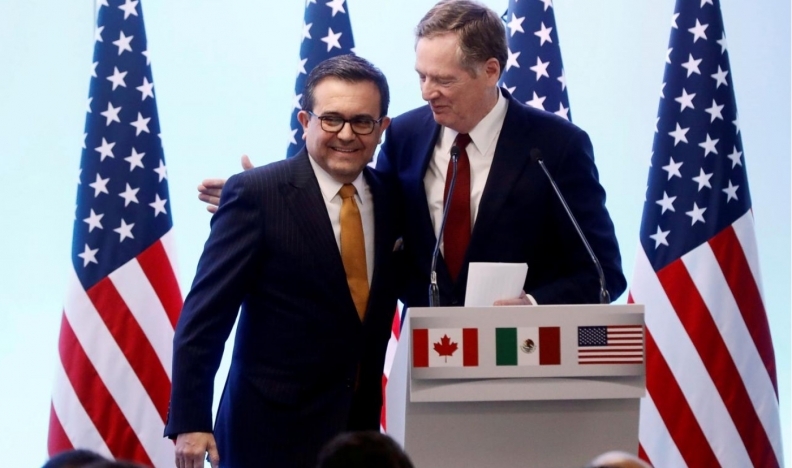 U.S. Trade Representative Robert Lighthizer embraces Mexican Economy Minister Ildefonso Guajardo during a joint news conference on the closing of the seventh round of NAFTA talks in Mexico City, Mexico March 5, 2018. The United States is moving forward on its bilateral trade deal with Mexico by month-end even if Canada is left out because negotiators can’t resolve their sharp differences over dairy and a dispute resolution system, U.S. Trade Representative Robert Lighthizer said. The Trump administration plans to present to Congress a text of the U.S.-Mexico trade agreement that was announced in August to revise portions of the North American Free Trade Agreement, Lighthizer said at an event in New York on Tuesday. The timeline is important because current Mexican President Enrique Pena Nieto wants to sign the deal before he’s succeeded by Andres Manuel Lopez Obrador in December, Lighthizer said. Under a U.S. legal process known as Trade Promotion Authority that was invoked to revamp NAFTA, American lawmakers need to review the text of the agreement 60 days before President Donald Trump can sign it. Lighthizer said the timetable for the new deal was set up so Pena Nieto can sign it before he leaves office on Nov. 30 -- an arrangement that’s acceptable to Lopez Obrador. The U.S. and Canada are at odds over anti-dumping dispute panels contained under Chapter 19 of the current deal, which the U.S. wants to remove and Canada wants to keep. Another sticking point is Canada’s protected dairy industry, which isn’t in the current deal but where the U.S. wants concessions. The U.S. wants to see the three-way pact remain intact, and the U.S. remains committed to keeping Canada in the deal now or to let it join later, Lighthizer said. Negotiations for possible exemptions for Mexico and Canada from U.S. steel and aluminum tariffs imposed earlier this year will take place after the new NAFTA deal is agreed on, said Lighthizer. Trump is serious about renaming NAFTA, possibly to the U.S.-Mexico-Canada pact, or USMC, Lighthizer added.